Prentice Hall Novel Collection Collections to meet your diverse needs! Prentice Hall offers a high-interest classroom library designed to accommodate a wide variety of reading levels—from emerging, to struggling, to advanced readers. This site includes a description of our different collections and the novels available within each. 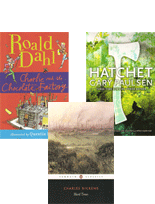 Whether you’re looking for classic literature for your on level or struggling students, chances are we have what you need!